Waterfalls appeared all over the park's iconic Ayers Rock landmark, which is also known by its Aboriginal name, Uluru. A record amount of rainfall has led to the closure of Australia's famous national park at Uluru. Waterfalls appeared all over the landmark, also known as Ayers Rock, at the heart of the park in central Australia. The Bureau of Meteorology (BOM) described the massive Christmas storm as a twice-a-century weather event. Flash floods in the remote town of Kintore forced the evacuation of dozens of residents. Northern Territory police told Australia's ABC Network that up to 25 houses were flooded in the town, near the border with the state of Western Australia. The town was almost cut off, with only severely impaired access from the Western Australian side, they added. 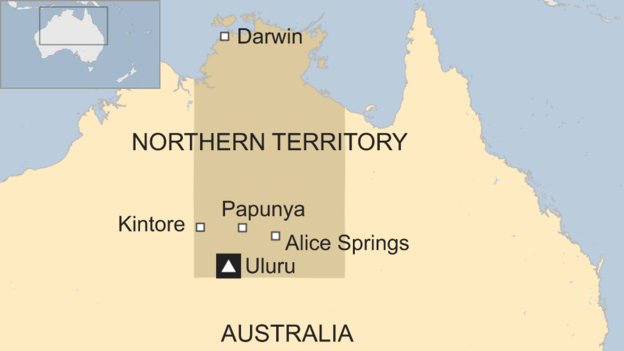 Papunya, another town 250km (155 miles) from Alice Springs, was completely cut off, while the town square of Yulara - the nearest community to Uluru - was inundated. Rangers closed the Uluru-Kata Tjuta national park at 09:00 local time on Boxing Day (23:30 GMT on Christmas Day), citing the risk of flooded roads and potential car accidents. "There's a lot of water … coming off the rock and what that does is just channels across the ring road around Uluru, some of those roads there were flooded by about 300-400mm of rain. Quite spectacular but very hazardous road conditions," park manager Mike Misso told ABC. Parks Australia said they had now reopened the park but urged people to drive carefully as there was still surface water on the roads. Uluru is a large sandstone rock in the outback sacred to the indigenous Anangu people, and one of Australia's top tourist attractions. A massive storm created waterfalls on Ayers Rock at the heart of Uluru-Kata Tjuta National Park in central Australia on Christmas night. This “twice-a-century weather event” forced the evacuation of dozens of residents after a record amount of rainfall led to the closing of the park, according to BBC News. According to police, as many as 25 houses were flooded in the remote town of Kintore as a result of the storm. “There’s a significant number of houses that have been affected by flooding in some capacity,” said acting superintendent Pauline Vicary, per the Daily Star. Papunya, another town affected by the storm, was completely cut off. Yulara, which is the closest community to Uluru, was engulfed by the rainfall. The park was closed the day after Christmas due to the flooded roads. “There’s a lot of water…coming off the rock and what that does is just channels across the ring road around Uluru, some of those roads there were flooded by about 300 to 400 millimeters (12 to 16 inches) of rain,” Mike Misso, the park manager, said, per BBC News. According to Sky News, Uluru usually only gets 22 centimeters (8.66 inches) of rain per year on average. However, this Christmas storm brought more than 23 cm (9 inches) of rain in just 24 hours. The park has been reopened, but offiicials are encouraging people to take precautions as surface water remains on the nearby roads, BBC News noted. Uluru is one of Australia’s top tourist attractions. It’s visited by as many as 500,000 tourists a year. Videos of the weather event were shared on social media. 0 Response to "After Massive Storm, Waterfalls Appear Over Australia's Ayers Rock Landmark"